I enjoy the version of Pride and Prejudice where Colin Firth plays Mr. Darcy, and there are two versions of Sense and Sensibility which I appreciate. I do not know who plays who in my version of Emma, but I like that one immensely. But the version that Gwyneth Paltrow is in is terrible, just terrible – in my ‘umble opinion. One of the things these three stories have in common is their lead players’ sharp wit. The ladies in Pride and Prejudice, Sense and Sensibility, and Emma all have razor tongues that cut as deeply as swords. Mr. Knightly and Mr. Darcy are not to be outdone by their ladies and have wits as acerbic as the girls’. Whoever suspected that verbal fencing matches could be so much fun? Nothing we have today is this cutting, this incisive, readers. It was truly an art of the time and these women were as adept at it as any samurai with his sword. 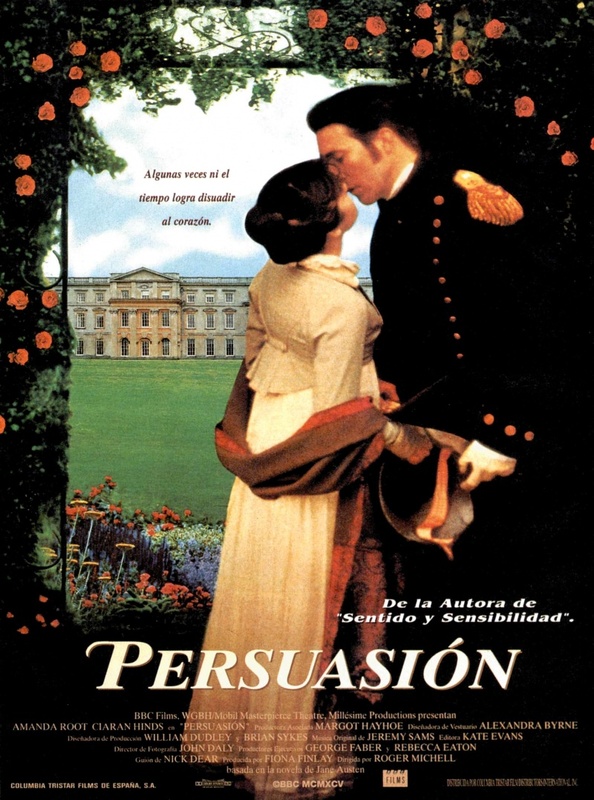 So when I saw Persuasion, I expected Anne Elliot to be just as quick-tongued as Jane Austen’s other heroines. But as the film progressed, I became disappointed, then confounded, then content. Why? Anne is quick-witted, but she does not bite during the course of Persuasion. She hardly even barks. The middle of three daughters, Anne fell in love at a young age with a young officer named Frederic Wentworth (played by Cíaran Hinds). He proposed to her when she was nineteen but, since his financial prospects did not look good, Anne was persuaded not to marry him. She refused his offer despite the fact that she did in fact love him and he loved her. It has been eight years since this occurred by the time Persuasion starts. Anne has been taking care of her foppish father and bratty older sister, Elizabeth, for these eight years, making her an old maid by the standards of the times. Her younger sister, Mary, is married to a Mr. Charles Musgrove and has two boys, who are unmanaged. Mary is always complaining of aches and pains, mostly so she can get her own way. She is so annoying that her husband takes every opportunity to go outdoors and hunt with his friends. Between the two of them it is not hard to see why the children are so undisciplined. We learn at the beginning of the film that Anne’s foppish father has all but bankrupted the family, forcing him, Anne, and her older sister to “retrench.” In order to pay their debts they have to move to Bath from their country manor, which they must also rent to raise funds. A friend of Anne’s mother, the widowed Lady Russell, is the one who convinces Sir Walter Elliot that he has to move. Otherwise he would have to be dragged from the place by his heels. Her father, Elizabeth and her companion, Mrs. Clay, depart for Bath. Poor Anne is left to prepare the house for rent, pack what the family “requires,” and then go see Mary, who says she is sick again. Neither her father nor her sister suggest they want anyone else to help with the work. They certainly do not volunteer their own time. Instead it is always Anne’s job to handle the practical matters. Elizabeth seems to hold Anne in complete contempt and there is little love lost between the sisters. The family estate, Kellynch Hall, is to be rented out to an admiral in the British Navy – whose wife happens to be the sister of Captain Frederic Wentworth. Staying with her sister and in-laws at Upper Cross as the tenants move in, Anne ends up listening to the family’s vehement complaints about each other. Most of the Musgroves’ complaints about Mary are more than justified. Mary is as self-centered and snobby as Elizabeth, but she has less control and wit, holding Anne more as her personal lady-in-waiting than as a despicable housemaid. She is petty but on a lower level. Anne’s the only white sheep in the whole family since her mother’s death. The best thing about Anne’s stay in Upper Cross is that it means she will not have to see Wentworth, who is coming to visit his sister. So when her old flame turns up one day unannounced, Anne is thrilled, but also frightened. Wentworth feels somewhat the same. He still loves her, but he also does not want to get close to her. She turned him down once and he does not expect her to change her mind now. Nor does Anne expect him to propose to her again, given that she turned him down so long ago. As the film progresses, we see Anne come out of her shell. Slowly, she breaks away from her empty-headed father and his fascination with power and fashion, as well as her bratty big sister’s control. She becomes a woman who can make her own decisions, standing firm when others demand she change her mind or do something they want her to do or believe is best for her. Eventually, she tells the man who still loves her that she does love him in return and that she will marry him. The best scene in the whole film is also the only time we see Anne and Wentworth kiss. As a circus pulls into town Anne and her future husband clasp hands, with the camera taking special care to hover over their hands before this happens. While the world, represented by the circus, rattles on down the street and turns right, Anne and her beloved walk in the opposite direction. They are arm in arm as they converse quietly together. That is all I am revealing about the film, readers. It is a masterpiece in every sense of the word, especially the scene I described above. Persuasion was written, I believe, when Jane Austen was at the top of her craft. Her first stories are marvelous tales, full of action, intrigue, and wit with teeth. But Persuasion is the cream of the crop. And I do not say that lightly! If you can, readers, find Persuasion and view it. It is a chick flick, but it is a chick flick with style. Not many can claim that and get away with it. This entry was posted in Movie Reviews and tagged Amanda Root, Anne Elliot, Cíaran Hinds, Colin Firth, Corin Redgrave, David Collings, Emma, England, English, Frederic Wentworth, Gwyneth Paltrow, Jane Austen, John Woodvine, Judy Cornwell, Movie Reviews, movies, Mr. Darcy, Mr. Knightly, Persuasion, Pride and Prejudice, Regency England, romance, Sense and Sensibility, Sophie Thompson, Susan Fleetwood, Victoria Hamilton on June 9, 2017 by The Mithril Guardian.